For over ten years, observers have been noticing white aerosol trails being dispersed in the skies that don’t behave like usual condensing jet exhaust. 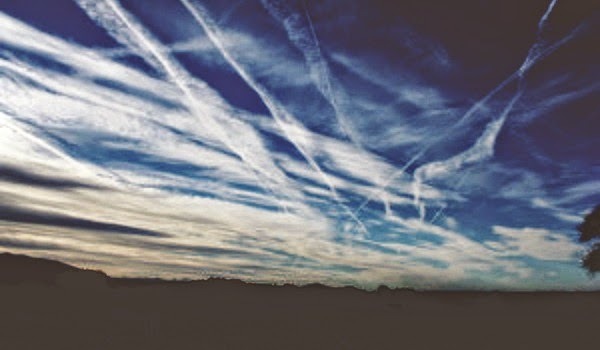 When seeking explanation, investigators are told by the government that these are just the normal “contrails” that we see coming from commercial jets and that they are perfectly safe. However, they don’t dissipate the way regular condensation trails do. They linger for hours, spreading across the sky, and are often laid out in cross hatch patterns. The government has refused to test samples collected underneath the trails. Now a TV news report from Germany has confirmed that their military is in fact doing aerial spraying of chemtrails. An article from the NIH, the National Institutes of Health, confirms that not only are chemtrails real, but they are suspected to be responsible for a variety of neurotoxic conditions including MS.
Support Organizations Active in Exposing the Truth About Chemtrails – Check out this comprehensive list of chemtrail organizations. You can also get involved with Global Skywatch to take action.